There is a reason that the ancient Mayans believed Cenotes to be the entrance to the Underworld. They are limestone sinkholes that have been filled with freshwater, often enclosed in dark foreboding caves with stalactites and tree roots reaching down eerily towards the water. Mayans used to leave people to drown in cenotes as a form of human sacrifice, but the remains have since been excavated and all is left are fish and beautiful fresh water. Our Mayan guide, Juan drove us down a lane and stopped at a wooden shack which housed an old man in a hammock who sleepily appeared at our door to take payment of £1.20 each. This cenote had only opened recently and no-one knew about it yet! Juan excitedly ushered us towards some rickety wooden steps leading down into a deep, dark hole. I really couldn't believe that we had paid to do this and that he expected us to enjoy it. Juan asked the ancient Gods for blessings and permission to use the space before we reached the edge of the water and looked into the abyss. You could not see a thing. Yax-ha had only been open for 2 months. Near Merida. Anyone who knows me, will be familiar with my fear of dark water. It makes my blood run cold, my heart rate increases and I feel like I need to run away. But parenting does funny things to you, so I shakily dropped into the water whilst telling the children HOW MUCH FUN IT WAS. It turns out, it was actually beautifully refreshing, swimming in that dark, sacred cave with the blind white fish swirling around my feet. We were hooked and vowed to visit as many of the 2000 cenotes on the Yucatan Peninsula as we could. Though natural in their construction, cenotes are big business for locals and tourists alike, many charging upwards of £15 per person for entry. They are an amazing natural phenomenon all connected by underground caves and rivers. No wonder the ancient Mayans found them sacred. So here are a few of our budget favourites during our time on the Yucatan. The next cenote we visited was in Valladolid town centre. Considering it was so easily accessible, we were surprised how natural the surroundings remained. Yes, bus tours walked through it every hour or so, but there were never too many people swimming in the water for it to be crowded. The children liked it so much we went every day. At £2.50 per adult, we could easily afford it and even on rainy days the children didn't get bored jumping off the rocks (though it was slippery; so be careful!) There were ropes that crossed the expanse of water for people to hold onto in case anyone got tired. If you stayed still for too long though, the fish nibble your toes. I didn't like this, so I kept moving. Zaci Cenote in Valladolid town. A fifteen minute taxi ride out of Valladolid town centre- these cenotes are across the road from each other, but you can pay for the pair at £5 per adult, children were free and there were lockers and life jackets available for all that wanted to use them. Samula had a steep, narrow entrance and opened out to a cathedral- like expanse of space. 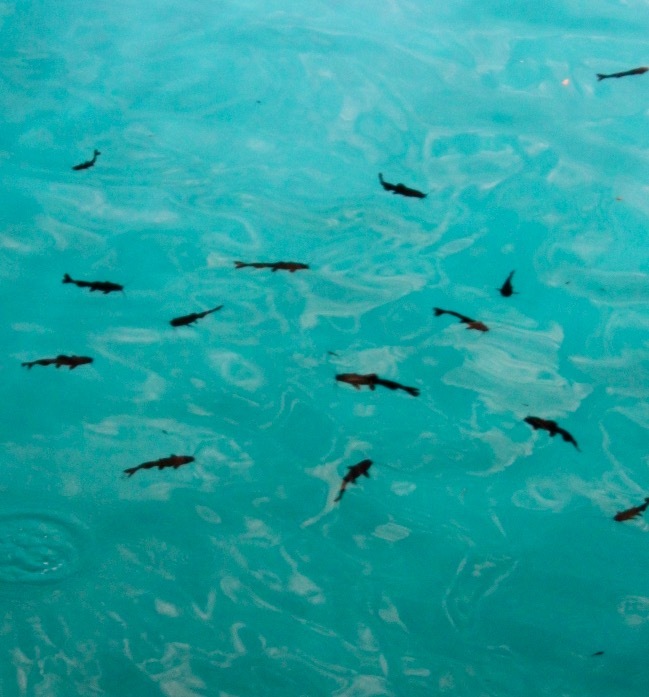 There was a hushed and hallowed atmosphere as the beam of light shot through the turquoise water and highlighted the black catfish who called it home. The cenote had a soft, sandy bottom and was full of 'pedicure fish' who nibble your feet. We stayed there, floating around for a long time before braving the harsh sunlight and heading to the next one. Xkeken was darker and more intimidating, in fact the children didn't want to go in as they were anxious about the darkness of the water. Keen to show no fear (I am Mother HEAR ME ROAR) I tentatively picked my way across the dark, slippery rocks. I found a fellow Brit in the water called Cat. Chatting to her took my mind off the over friendly catfish and it turned out I went to university with her brother (?!?). Once I got used to it, swimming under the shaft of light amongst the tree roots and stalactites was both exhilarating and peaceful. it was worth the heart palpitations for sure. These lovely catfish were in most of the cenotes. Emerging from the cenotes is supposed to be akin to rebirth according to the Mayans. I couldn't agree more. I had a a Romantic idea that we could cycle between the cenotes, but this was unrealistic with the children. We emerged from Xkeken cenote, blinking away the sun. Cat translated for us and we realised the taxi could drive us to Oxman cenote for £5 AND wait for an hour to take us back to Valladolid afterwards. We bumped our way to the Oxman cenote over the pot holed road running through a rubbish tip that was home to a wake of vultures. We arrived to something like a health club. Paid our £3 per person (deciding not to take the lunch and pool option) and beyond the pool, found a sink hole of the bluest blue that was open to the sky. We wound down the steps to get to the crystal clear water which owed its vibrant colour to the fact that it sat at 213 feet deep. To top it off, there was a rope above the water which we took turns swinging on and plopping inelegantly into the depths. It is always surprising how cool the water is without being cold. It feels like it should be freezing in the limestone sinkholes, but it was the perfect temperature for a humid, August day in Mexico. Before we could catch our breaths from all that swinging and plopping, our hour was up and we headed back to Valladolid with our new friends. Casa Cenote is like a river that loops around- here is a map of where to swim and snorkel. The crocodile was towards the end of the loop at the furthest point form the entrance. We caught a taxi to Los Ojos which is famously beautiful cenote, then realised that the entrance was £55 for us all. Indignant and disappointed that my best negotiating couldn't get it any cheaper, we hailed a taxi and asked the driver to take us to his favourite spot. Casa Cenote was a beautiful place, off the beaten track about 15 minutes outside of Tulum. It cost £5 per person to get in and was a slice of heaven. It has a mixture of freshwater and saltwater as it has underground feeds from the sea just a few metres away. This made the water look like it moved in swirls and we happily snorkelled around the mangroves for hours. The colour of the water was like swimming in a jewel- I have never seen anything quite like it. Casa Cenote, Tulum. The water was the brightest and clearest I have ever seen. There were barracuda nestled in the mangroves and I started to think I could see movement amongst the mangrove roots... saltwater + freshwater + mangroves + big fish sounds like perfect recipe for crocs, but what do I know? The guide at the start told us which fish we could expect to see and assured is it was completely safe from predators. After a couple of hours we got out to have some lunch at the restaurant on the sea front. An Australian tourist came running out the water, shouting he had just seen a 2 metre crocodile and did anyone want to GO BACK IN TO TAKE A PICTURE? Surprisingly, people did just that whilst we waited on dry land for the photographic evidence which he swiftly supplied. We mentioned on the way out that a crocodile had been spotted... the Mexicans laughed. "Ah yes! He is our friendly crocodile and never hurts anyone!" I looked at the children and then asked if the kids would stand a chance.. he sort of laughed and walked away. I was grateful at that point that the children didn't want to go deep into the spooky darkness of the mangroves. It was hometime, kids. We caught a 5 minute taxi and paid £6.50 per person to get in. There were a lot of signs making people aware of the importance of not wearing sunscreen or insect repellent whilst bathing. It is easy to see how these chemicals can harm the fragile eco-system, so a few (thousand!?) mosquito bites was a price I was happy to pay. Snorkelling here was ethereal- you could go into a cave and swim amongst the underwater stalactites and observe the shafts of light breaking through the water. It felt like you were in another world. There were so many fish and turtles who were friendly and totally used to humans swimming with them that you felt completely at home in that underwater world. Grand Cenote, Tulum. LOOK AT THAT WATER. This experience was magical, made better by the fact that we arrived early and basically had the place to ourselves. As it got closer to lunch time more and more people arrived and we decided to leave as it became hard to swim. Is there anything else you'd like to read about? Older Post22 Things that surprise me about Belize.